I love the colors associated with Valentine's Day. But I didn't always love Valentine's Day (until I had my own Valentine). 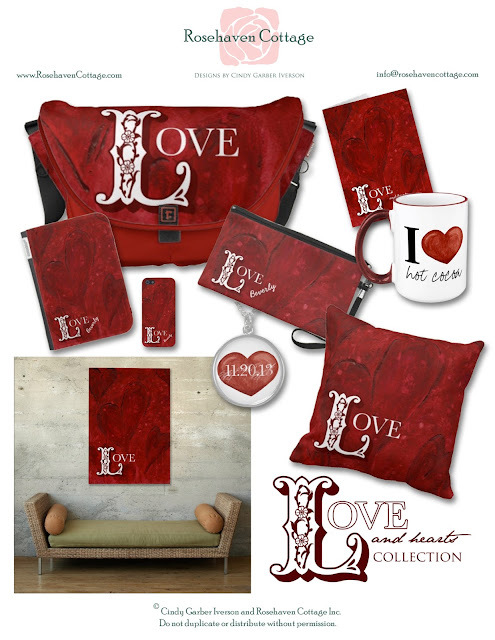 If you love the color of Valentine red as much as I do then I hope you like my new "Love and hearts" collection of home decor, office and technology accessories and fashion accessories. I've designed this bag so you can personalize it with your name and email contact info permanently printed on the inside in case the bag is lost. This isn't just any messenger bag either. This is a Rickshaw Zero messenger bag made with a sustainability focus in San Francisco, CA. It's water resistant and machine washable with a large main compartment (large enough for a 15" laptop) and 2 front pockets. It form-fits to your body when you carry it for added peace of mind. Click above to see how you can have your own message printed on the interior of this card for a personal touch. There's interior art to showcase whatever you choose to say. This customizable mug lets you write whatever it is you love on your mug. I happen to love hot cocoa so that's the default design but you can write anything you want. Downsize your purse with this satin exterior personalized wristlet. Or use it as a cosmetics bag. Or store your special pencils and pens in it. Keep a special date close to your heart by personalizing this necklace with the date that is special to you--an anniversary, a birthday or other commemorative date. If you have a different mobile device other than an iPhone 5, let me know and I can make this design available for your device at no charge. Handmade with recycled materials in Brooklyn, New York, this case is wrapped with water-resistant fabric on the exterior and has a suede interior. You can put this out for the month of February as a seasonal home decor accent or keep it out all year round. The pillow is 100% cotton, machine washable, and made in the USA. Comes in many sizes with the largest being 40"x 57.5" (now that's extra large). You can even use the online tool to see what it will look like on your own wall before you order it.